The main goal of any marketing strategy is to focus on the best opportunities to increase sales – which in simple terms means get more clients! It’s your job to make your services known in the community and get people to come to your practice. Here at Prescription PR, we want to give you some helpful tips on how to successfully market your brand as a psychologist on Long Island. If you are looking for Long Island Psychology Marketing, we can help you! Get your brand out there! In addition to a mix of traditional advertising such as print, social media is extremely important. Social media platforms such as Facebook, Twitter, Instagram, and Google+ are now being fully embraced by all age groups and demographics, and as a healthcare provider, it is important to have a fully integrated social media campaign. The healthcare industry may be ripe with brilliant minds and state-of-the-art technology but many practices lack the time or manpower necessary to reach out to and build long-lasting relationships with their patients. You are the face of your brand – Your brand is different because you are certified to help people, you are selling a service rather than a physical product. Rather than choosing which restaurant to eat at, your clients put more time and thought into finding the right Long Island psychologist that will work for them, and that could be you! Patient feedback is essential as it can help attract new patients and help you to improve the perception of your practice. The number of online platforms available to leave reviews for any practice or business is increasing by the day and websites such as Yelp and Google+ continue to be incredibly popular not just with prospective patients but with search engines as well. Keep your website updated. This should come as no surprise. If you are attracting all this new attention you want your website to be top notch. Make sure to keep up to date with your services, hours, and make the website overall easy to navigate. How many times have you searched a business or practice in Google and looked beyond the first page? Chances are highly unlikely. Search engine optimization (SEO) refers to the process by which websites are developed in order to yield higher results on search engines such as Google, Yahoo, and Bing. These search engines use advanced algorithms to present the most useful websites as the top results. 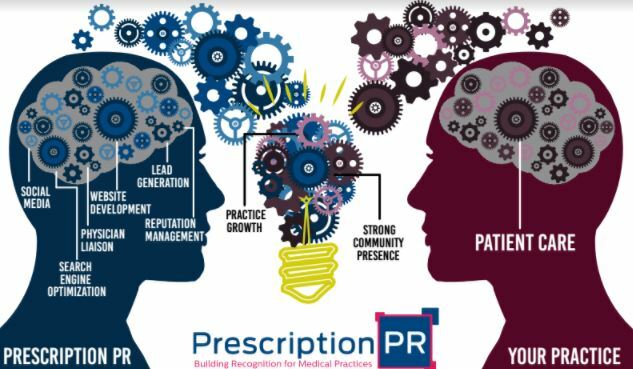 The marketing team at Prescription PR uses proven “white hat” methods of search engine optimization through unique user generated content as well as strong, keyword friendly links and tags. We will make sure the layout of your website is well indexed as we strive to organically create a seamless user experience. Content: Search engines favor websites with strong, continuously updated, and media-rich user generated content. User Experience: Does your website run smoothly? Are the pages within your website seamlessly linked together? We make sure your website is operating at peak performance. Tags and Keywords: We ensure these phrases are relevant to your practice as search engines use them to account for your overall web optimization. Social Media: Keyword strategy must also extend to off-site platforms such as Facebook, Twitter, and Instagram, we make sure they are consistent with your main webpage. Leave your business cards and brochures at other local businesses. The physician liaison is a relatively new role in healthcare but is increasing in importance. As the ever-changing landscape of the medical field puts more pressure on private practices to generate referrals, the physician liaison is responsible for developing relationships with potential referring physicians. Prescription PR offers physician liaisons that go beyond just increasing referrals for your practice. Our physician liaisons have excellent communication skills and are proficient at building successful relationships between doctors and medical practices. The goal of our liaisons is not to “make a sale”, but to build a rapport with physicians and medical professionals while maintaining already-established channels for referrals. The reputation of your practice will also be enhanced with the addition of our physician liaison program. The healthcare industry is built upon trust between doctors and their practices as referrals count for a majority of new patients. A liaison is in constant communication with a strategic variety of practices that are tailored to your specialty and can provide you with valuable information about your competition within the industry. Physician Liaisons are a key part of any healthcare marketing strategy as it will help not only to build relationships and increase referrals but will also help give you a competitive advantage within your specialty. Volunteer in your local community! This should be your top priority. If you are trying to reach the people living in your community, it’s no question that you should be involved in making the community a better place. It may even be a good idea for you offer a free wellness seminar at a local community group. Get your name out there! These five simple steps should help kickstart your new marketing strategy for your brand. Seize every opportunity available to get your name out there in your community. If you prioritize the people of your community they will think of your brand next time they need to make an appointment! If you need more help or are looking for Long Island Psychology marketing, contact us at Prescription PR by calling (631)392-4255 ext 100.